6 bottles of Formaglini Vineyards wine shipped to you 3 times a year at a 15% discount. David will send a mix of pinot noir, red blend, and chardonnay. shipped February, April, and November. $10 shipping charge for each shipment, so $30 annual shipping fee. Due to popular demand, Formaglini Vineyards has continued to expand beyond our coveted and awarded La Querica Block Pinot Noir. The first expansion was the Insieme Cuvee red blend in 2013 (which continues to sell out!) and now, our first white wine — Chardonnay! Your palate will always be pleased with David’s choice selects of his Formaglini estate pinot noir, red blend, or chardonnay. 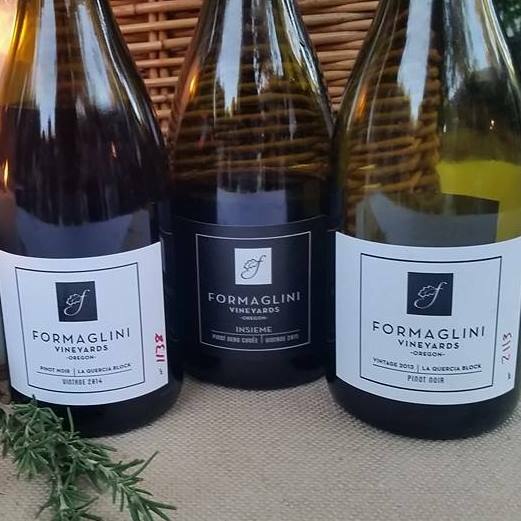 Winegrower’s Friends of Formaglini (FOF) Wine Club members will receive six bottles three times a year. Wine drinkers enjoy this variety will receive a 15% discount off retail pricing and just a $10 charge for each shipment. Shipments are mailed February, April and November each year. FOF members also have complimentary access to parties and tastings as well as invitations for private wine dinners and tailored functions. Wine Club members will also have first access to purchase library wines on temporary release.